The question of the efficiency of counter-terrorism policies seems to appear to terrorism studies as one of the most important, and yet is of the least researched (Lum, Kennedy and Sherley, 2006). The problem with that question is partly that the goals of counter-terrorism operations may vary greatly, in such a way that evaluating success is most complicated. As Morag puts it: “the fundamental concept of victory, in the context of fighting a war against terrorism, is unclear” (2005, p2). In fact, the situation is even more complicated by the fact that all intentions that motivate the enforcement of a particular policy are not always available to the public, and perhaps not always blameless. The question this paper addresses focuses on the political consequences of such policies. This is motivated by the numerous findings made by terrorism research about the psychological effects of terrorism. It has often been observed how terrorist activity may influence the outcome of elections (Landau et al. 2004; Gilboa, 2007; Berebi and Klor, 2008, Echebarria-Echabe and Fernandez-Guede, 2006). The point here is to try to understand whether counter-terrorism policies are only implemented for the sake of combating terrorism, or whether they may also be used with a view to influencing the results of elections. More precisely, this paper inquires into the possible use of specific offensive operations likely to lead to a major crisis in which the consequences on upcoming elections may appear to have motivated the action more than the strategic context. It seems, however, necessary to narrow down the focus to a democratic country having enough experience with terrorism for such practices to have emerged. In this respect, Israel seems to meet the criteria and to provide accessible data that may be useful to address the question. First of all, the psychological consequences of terrorism must be clarified for the method of this paper to make sense. Landau et al. (2004) have observed, in the case of the 9/11 attacks on the US, that terrorism may act as a trigger for death-related concerns to become salient, thus exploiting the Terror Management Theory. This unconscious process, they argue, results in an increased propensity for supporting charismatic leaders. Typically, one might expect the Israelis to become more supportive of charismatic leaders able both to reassure them and to embody their values in the heights of violence. Berrebi and Klor (2008), illustrated by Gilboa (2007, p12) in the case of the 2003 elections, similarly argue that in the case of Israel, terrorist activity tends to provoke a shift of the electorate to the right, rather than a mere polarisation (although this is observed, but to a lesser extent). This dense quantitative analysis argues that the partisan theory of voting seems to hold more for Israel than its policy alternative (2008, pp290–292). Simply put, this means that the political identity of the incumbent government and the way it handles ongoing security issues does not affect the way the electorate feels about its capability in that matter: they tend to presuppose, probably based on each political bloc’s ideology, that right-wing parties are more fitted to deal with threats to security than their left-wing counterparts. All this suggests that exploiting provocative counter-terrorism policies for electoral purposes - by making the presence of terrorism felt - is expected to benefit right-wing parties, and more particularly those led by more charismatic characters in Israel. Therefore it makes sense to focus on elections where the incumbent government during the campaign - that is, those responsible for counter-terrorism policymaking - are able to benefit from this. In this respect, the Likud seems most relevant, for it is usually perceived as a strongly right-wing party, regularly scoring high in national elections. Furthermore, over the last few elections that meet the criteria, it seems that the one that took place in January 2013 is most appropriate for the purpose of this paper. This is due to the fact that the other latest elections where the incumbent government was led by the Likud occurred in 2003 and 2006. Yet the former seems worth discarding because it occurred in the framework of the Second intifada. This considerably complicates the strategic and retaliatory justifications for counter-terrorism measures, multiplying the alternative hypotheses in a way poorly consistent with the validity of such a short study. On the other hand, the 2006 election is peculiar insofar as the incumbent Prime Minister, Ariel Sharon, was launching a new party after breaking away with the Likud to embrace a more centrist ideology. In this framework, the idea that he would have launched an operation meant to benefit his new challengers is hardly credible. Therefore, the question addressed by this paper focuses on the possible use of counter-terrorism measures by the Netanyahu government, with a view to enhancing their chances for the January 2013 elections. If, broadly speaking, the goal of counter-terrorism is to limit the threat of terrorism, then it seems fair to claim that disrupting attacks, dismantling or disabling an organisation and deterring it from carrying out attacks are several different ways of achieving this goal. Still, it seems necessary to distinguish between defensive and offensive counter-terrorism. The former is constituted of all the kinds of actions that involve thwarting terrorism in the narrowest sense. That involves, for instance, security screening measures in airports, target-hardening measures in general such as protecting embassies etc. (see Probst, 2005). Offensive measures, on the other hand, involve more disputed methods, such as targeted killings, collective punishment or other actions aimed at harming the terrorist organisation outside of the context of an attack. The problem, of course, precisely lies in the distinction between these two types of actions, for while defensive measures enjoy relatively undisputed legitimacy, offensive operations are more often criticised. Therefore, the line between these two types of activities is often blurred by the desire of the counter-terrorism policymakers to present most operations as defensive in nature - for none would deny one’s right to self-defence. In the case of targeted killings, for instance, Kendall (2002) displays a great deal of efforts to establish this Israeli practice as self-defence. However, many have observed that some operations may backfire, insofar as they may increase the resolve and popularity of an organisation instead of disabling it. This is what Ganor calls the “boomerang effect” (2005, p129). As Morag (2005) argues, some of the major goals of Israeli counter-terrorism are naturally to limit the number of Israeli victims to terrorism, to limit the negative economic consequences of such attacks, to optimise the government’s popularity both domestically and internationally, and to undermine that of the Palestinian Authority (see Brym and Gazit, 2011). The latter case, Brym and Gazit argue, would be the cause of the implementation by Israel of such policies known for their “boomerang effect”: “Israel’s assassination of political leaders typically causes more Palestinian outrage and intransigence, and has more negative implications for Israel domestically and internationally, than does the assassination of military operatives” (2011, p3). In the light of the question this paper seeks to address, it seems fair to focus more closely on counter-terrorism operations likely to have similar results. That is, an offensive operation susceptible of generating a greater climate of tension and insecurity - if not more violence altogether. This involves, as explained above, the targeted killing of political leaders (as opposed to what Brym and Gazit call “ticking bombs”), but also other types of actions likely to provoke the anger of the Palestinians. One may evoke more “conventional” military operations, such as bombings carried out by the IAF that tend to be rather indiscriminate in terms of victims. Operation Pillar of Defense began only 69 days before the January 22, 2013 election, making it the fifth election out of the last seven to take place months after an IDF operation. Left-wing activists and politicians accused Prime Minister Binyamin Netanyahu and Defense Minister Ehud Barak of launching the attack on Gaza on Wednesday in order to win the electorate’s approval". In order to examine whether OPD may have been an attempt at using an offensive counter-terrorism intervention to generate a climate of emergency likely to be exploited during the upcoming elections, it seems necessary to ask whether it was necessary, proportionate, and effective. The issue of necessity is here understood as contextual elements justifying such a sudden break in Israel’s counter-terrorism policy. Insofar as defence is a reaction, the question is about what provoked it, and to what extent that is enough to understand why the reaction changed. Proportionality, on the other hand, addresses the issue of coherence in scope between the means used and the goals pursued. A failure to meet this criterion may suggest either that the agent is irrational or poorly informed, or that the goals pursued are not those stated. Finally, effectiveness suggests an assessment of the relationship between those same stated goals and those achieved - and the extent to which the difference, if any, was not foreseeable. Therefore, a mixed methods design seems more appropriate, since all of these questions rely on analysing the incentives for action expressed by the decision-makers, and then compare these to real world data in order to conclude whether they can be justified by the course of events. It seems necessary to claim here that the issue of whether the elections were actually influenced by the operation is irrelevant, for this is a matter that relies on several contingent factors that could not necessarily be taken into account by the decision-makers. The purpose of this paper focuses on the question of intentions, not of actual effects. In this respect, it seems fair to analyse the justifications officially given for action, and the accounts of the operation, and then to confront this interpretation to more objective evidence likely to highlight whether other motivational factors are needed to make sense of the decisions made on the timing and method of the intervention. The study is hence divided in two main sections: first, a brief but necessary thematic coding analysis of official statements related to the Operation has been carried out. The official incentives for action, goal(s) of the operation and their relationship to the choice in the method of intervention were to be clearly identified for the second part of the study to collect and analyse relevant data meant to confirm or challenge the claims made by the decision-makers on their purely strategic motivation. Given the space constraint, however, it was not possible here to run an extensive review of the Israeli government communiques concerning the operation. In order to triangulate the information and obtain a more nuanced picture, both the review of OPD published on the Israel Security Agency’s website, the one published on the website of the Ministry of Foreign Affairs (MOFA), and the summary of events displayed on the blog of the Israeli Defence Forces have been analysed. The three of them were issued during and shortly after the events. This choice was essentially based on the need to encompass the possible discrepancies in official accounts addressing different audiences. Arguably, the ISA’s website would address more Israeli nationals than the MOFA’s which is, by essence, dedicated to external communication. Finally, the IDF account is interesting for, although still being issued by an official source, it is relatively more informal in its layout, and seems to address a more readily complacent audience. All three sources have thus been coded and analysed separately before being combined and their findings confronted with each other. The second, more substantial, section focuses, as explained above, on contextualising the intervention in order to challenge or confirm the claims on the necessity and proportionality of OPD, and to identify whether the possible political motives outlined by the literature review are to be taken into account to fully make sense of the decision to react this way. In order to carry out such an analysis, it seems that a quantitative method is more appropriate. Yet the controversial nature of the data sought here and its relatively difficult accessibility demands several data sources to be exploited. Therefore, the data used in this paper concerning the number of Palestinian fatalities is extracted from the B’Tselem online database. This source, already used in works such as Brym’s (2012), has the advantage of providing rather extensive data on the conflict and enjoys quite a widespread recognition. Data concerning rocket/mortar attacks and Israeli casualties/fatalities, on the other hand, come from the archives of the Israel Security Agency, available online, because B’Tselem only provides a yearly count of the former, and does not provide figures concerning Israeli casualties. 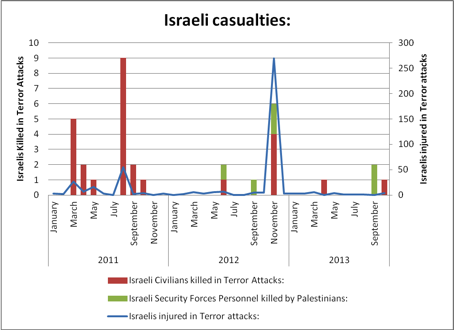 Besides, its figures concerning Israeli fatalities appear to differ slightly, at times, from those displayed by the ISA. Due to the structure of the datasets, it is unfortunately not possible to have daily data. Therefore, the time unit used in this study is the month. Besides, in order to be able to deal with the data efficiently, its range has been limited to the number of Palestinian fatalities and killed and injured Israelis. The Israelis were divided between civilians and security personnel, and the Palestinians between combatants and non-combatants (according to B’Tselem figures). One more accurate type of counter-terrorism measures taken into account is the number of people killed in the course of Targeted Killings counted by B’Tselem. This measure has been noted because, as it has been argued, it may at times result in provoking more Palestinian resentment than in actually disrupting terrorism. Finally, the two last variables are extracted from the Israel Security Agency archives: they are the monthly count of rockets/mortar shells launched from the Palestinian territories, the number of attacks this represented, and the total number of terror attacks that occurred in Israel. It is worth stressing here that the ISA’s understanding of the words “terror attacks” is rather broad, for it appears that it ranges from stone-throwing and stabbing attacks to suicide-bombings. This shows that there are possible inherent biases in using the data provided by a party of the conflict (Israel). Not least is the risk of self-victimisation. Yet the MOFA and Shin Beit sources have the advantage of being accessible, documented, and collected systematically over a long period of time by a centralised and national administration. Finally, all of these data have been collected over the period January 2011- October 2013. This range enables one to observe the development of more long-term patterns in the data, including the two years that led to the operation, and the possible long-term consequences it had in the following year. While carrying out the thematic coding analysis, the codes used focused essentially on Israel’s justification of the necessity, proportionality and efficacy of the intervention. Hence, the themes of responsibility, changes in the intensity of the conflict (both before and during the operation), Israeli goals and their hypothetical achievement as well as the nature of the IDF actions were paid particular attention. Hamas’s responsibility for the escalation. That Israel was under a growing threat (the operation was pre-emptive). It was a response to increasing actual violence. The “surgical” nature of the attacks. The unprecedented intensity and frequency of Hamas’s attacks both before and during the operation. Hamas’s responsibility for any hypothetical harm caused to Palestinian civilians. The operation was a reaction to Hamas violence. The IDF successfully attacked terrorist targets. The human and material cost was high for Israel. After confronting these codes with each other, the Israeli account is clear: OPD was a direct defensive response to an intolerable escalation in rocket hits launched by Hamas terrorists (in the most value-laden meaning of the word). The goal of the operation, as stated several times, is to enforce a ceasefire on Hamas. The IDF reportedly hit “1500 terror sites”, providing no evidence confirming this qualification. Even further, the claim the rocket hits dramatically increased is generally supported by a chart (or a link to a chart) meant to illustrate this point. Interestingly enough, the latter often includes in the figures meant to have justified the operation the rockets launched during these 8 days. This is the case, for instance, of both the IDF blog and the Israel Security Agency that provide, with the claims that rocket and mortar hits escalated before the operation, links leading to monthly or yearly agglomerated data giving the misleading impression that the 1500 rockets launched from Gaza during the operation - thus quite likely to result from it - are the reason why it had become necessary to intervene. Another major theme observable in these samples is the death toll Hamas was imposing on Israel. Similarly to the issue of rockets, the claim is that the number of Israeli killed or injured before the operation had increased so sharply that intervention was necessary. Yet the data supporting this claim seems to suffer from the same fallacy as those focusing on rockets and mortars: suggesting the consequences of the operation as its cause. This is mostly achieved through a misleading way of aggregating and presenting the data, and will therefore demand closer scrutiny. It was a matter of emergency: it resulted from an escalation that took place over a few days. This escalation manifested itself through a sudden and sharp increase in rocket-mortar launches and in the number of victims of Hamas terrorism among the Israeli civilians and security personnel. And during the operation, Israel showed a self-restraint in the use of force that was only equalled by the ruthlessness of the Palestinian reaction. Israel targeted and harmed mostly (if not only, as suggested by the almost complete absence of the question of collateral damage from the official websites) terrorists and combatants, however hazy these categories may be. The sub-theme of unprecedented levels of violence before the operation. The theme of success: the operation was a great achievement. What matters, in this study, is to inquire into the validity of these statements, not only objectively, but to try to understand whether they could credibly be held by those responsible for the launching of the operation, or whether some other explanatory factor may be needed to fully make sense of their decision. Therefore, the following step in this study is to explore the “unprecedentedness” and intolerability of the events that led to the crisis (mostly related to the question of “necessity”), and the outcomes of the operation as they could be expected and observed (involving both the issues of “proportionality” and “efficacy” of the intervention). The major argument given by the decision-makers concerning the timing of OPD is that rocket and mortar launchings reached an unprecedented frequency just before the intervention. Along to this, the claims concerning the proportionality (the “self-restraint” showed by the IDF during the intervention) are another crucial element of the official account of the events. Finally, the claim that the attack was successful is interesting because of its ambivalence. Indeed, success is a relative concept that depends on what scale is used to measure it. Therefore, the possible biases in the making of this statement are to be analysed. The argument given for the necessity of the intervention is that the conflict “escalated”. One may reply that it takes two players for a situation to “escalate”. But the account given by Israeli officials is that this escalation was unilateral. The unprecedented nature of the attacks that occurred on the few days leading to the crackdown is taken to be the major reason why such a large-scale operation was necessary. 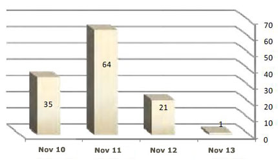 Figure 1 is a bar chart that can be found on the Israeli MOFA website. It displays the number of rocket hits that occurred in the four days that led to the operation. Fig.1: daily distribution of rocket fire before OPD. Source: Israel MOFA. This chart, surprisingly, seems to suggest that when the operation was launched, the “emergency” character of the situation was not so clear. This is not to say that reacting was not justified, but more that the strikes involved by the operation may have been more retaliatory than purely defensive, since they occurred some two days after the climax of the attacks, when they appeared to be fading away. It ought to be added, however, that when added, the number of mortar shells brings the figures to around 100 hits on 11 November. Therefore, reacting seems naturally quite fair when faced with such intense attacks. On a more diachronic perspective, however, one may question the “unprecedented” nature of the situation. 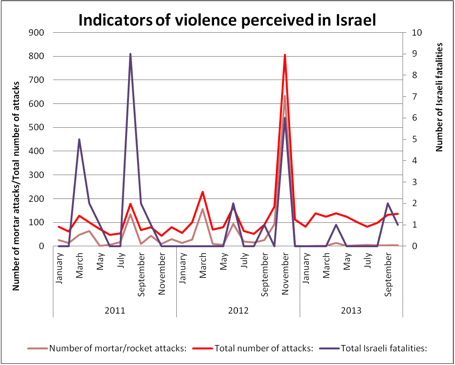 Indeed, when displaying the monthly number of rocket and mortar attacks that occurred between January 2011 and October 2013 (Figure 2), it appears that rather high peaks had already been reached. Fig. 2: Number of rockets and mortar shells launched from Palestinian territories. Data collected from the ISA. As the data show, before the situation escalated, the number of attacks was not unmatchable with the near past on a monthly level. Several intense episodes had taken place before, with some 218 hits in June 2012 (197 rockets), and 192 in March of the same year (173 rockets). 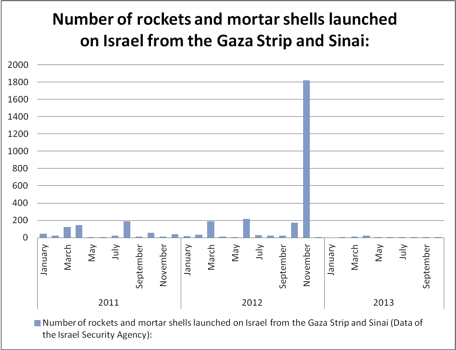 Even earlier, 191 hits have been counted in August 2011, of which 145 were rockets. Hence it may be argued that, although such intense attacks (over 120 hits in 3 days) may not have happened in the near past, it was not unknown to the Israeli security forces that the Palestinians had the capacity to be so active. In fact, it appears that over two days in June (19–20) 2012, the Palestinians terrorists (reportedly Hamas) had already launched some 112 projectiles into the country, according to the MOFA. It is hard not to notice how such an event is comparable to the escalation that led to OPD. The same may be said of the amount of fatalities caused by the attacks. Indeed, none was killed before the operation was launched in November 2012, and as Figure 3 shows, there was no particular increase in the previous month(s) in this respect either. The same may be said of the number of Israelis injured in terror attacks. Hence, these motives hardly hold in establishing the dramatic worsening of the situation. Fig. 3: Number of Israeli casualties: injured and killed. Data collected from the ISA. Again, all this does not amount to claiming that the Israeli response was unjustified, but it does raise the question of its timing. Indeed, it is interesting to observe that the major crises that occurred over the previous two years never escalated to that extent. Although the attacks were usually followed by Israeli Air Force strikes, mostly on weapons factories and other critical military infrastructures, nothing comparable in scale had been launched since the Operation Cast Lead that took place in 2008 after some intense provocations of Hamas, newly in power after the unilateral withdrawal of Israeli forces from Gaza (Byman, 2011). It seems quite possible that OPD may be accounted for by weariness, after so many attacks that would always end on a temporary truce followed a few months later by another burst of violence. Israel has naturally grown desiring, like the official statements claim, to impose a genuine ceasefire to Hamas. But again, that over more than two years, the situation becomes so intolerable exactly two months before national elections is an interesting coincidence that might be understood by taking this deadline as a motivational factor. The point this analysis tries to make is, overall, very simple: the context that led to the operation was not unique. The same intensity in violence had already been reached, at least in June, and possibly two more times: in March of the same year and August of the year before. Yet no such reaction had been deemed necessary these times. The question explored in this section focuses on what type of actions were carried out during OPD, and how these choices may make sense with regard to the objectives of the operation. It has already been highlighted that some types of intervention are particularly likely to provoke more resentment and resolve among the Palestinians than others. This is the case of Closures, targeted killings of Palestinian high officials, and all types of relatively indiscriminate attacks, such as airstrikes. With regards to the operation, it started by the targeted killing of Ahmed Jabari, “Head of Hamas’ military wing in the Gaza Strip”, claims the IDF blog. Many accounts of the event, including the Israeli official statements, acknowledge this as the source of the intense bombing that took place shortly afterwards (the famous 1500 rockets and mortar shells). To this must be added another 14 targeted killings that took place that same month. Given debatable the tactical usefulness of many of them may be, it is clear that they provoked a burst of outrage in the Gaza Strip likely to be responsible to a certain extent for the ensuing escalation. 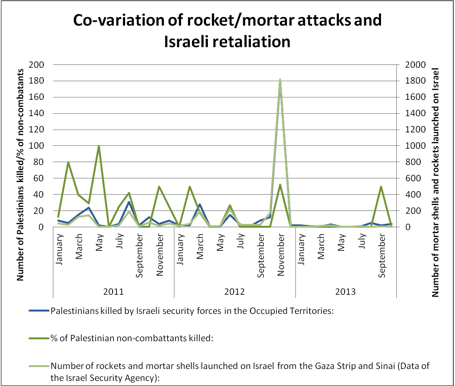 Nevertheless, the data collected indicates a strong correlation between the number of mortar/rockets launched from the Palestinian territories and the number of Palestinians killed by the IDF, as Figure 4 shows. The visual impression is confirmed by calculating the correlation coefficient between Palestinian fatalities and rocket/mortar attacks which appears to be quite significant: approximately 0.964. The same analysis reveals a correlation coefficient of 0.84 between the number of Palestinians killed in the course of a targeted killing and the number of mortar/rocket attacks. Fig. 4: Co-variation of rocket/mortar attacks and Israeli retaliation. Data collected from B’Tselem and Shin Beit. The major obstacle to the running of a causality test (such as a Granger causality test, or more sophisticated correlation analyses) lies in the very structure of the data. This would require daily data, for most likely, the reaction time between the killing of a Hamas leader and the retaliatory launching of rockets, or the other way around, is a matter of hours more than of months. This is what was observed in the very beginning of OPD. Besides, the prospects for two-ways causality seem quite promising, and would therefore require a thorough study of the spiral of retaliatory violence in the conflict. Again, however, this is impossible with the data used in this paper, and is further complicated by the apparent lack of exhaustive databases providing such accurate and trustworthy information. In the light of the data gathered here, however, it is possible to conclude that killing of Palestinians as a response to rocket attacks, or its opposite, is nothing new in the way of settling a crisis. Therefore, in this respect, it doesn’t seem that the policymakers have adopted a peculiar approach. Yet it appears that the use of violence was rather indiscriminate, since according to B’Tselem, roughly 52% of the Palestinian fatalities were non-combatants. This is the third highest peak in this variable over the last 3 years; and given the scale of the operation, it certainly stands for the most devastating amount of collateral damage caused by an Israeli intervention over this period of time. This, it has been argued, is most likely due to the very nature of the operations: they consisted essentially of IAF strikes on “1500 terror sites”. Although this type of tactic could, like targeted killings, easily account for the violent reaction that the 8 days of fight witnessed, its selection (and thus the exclusion of, for instance, sending troops to the Gaza Strip) may also be accounted for by the electoral context. This does not necessarily means that this tactic was chosen because it was susceptible of provoking a violent response, but at least because it is the least dangerous for the IDF (who are less exposed in planes than on the ground), since Ganor (2005) has rightfully pointed out how sensitive to security personnel fatalities the Israeli population may be. As explained above, a counter-terrorism operation may have two different levels of objectives: the ones that are inherent to their very nature: reducing terrorism, limiting the amount of Israeli killed or injured, disrupting terrorist organisations etc. These all amount to the same idea: countering terrorism. On another, tactical level, each offensive operation must have some clearly identified goals. In the case of OPD, the latter have been identified as being the enforcement of a genuine ceasefire with Hamas on its projectile-launching attacks. Yet arguably, if the nature of the operations fail to limit the threat of terrorism and restrains only one form of it but exacerbates others, it may barely be considered a success. In the case of the present operation, many reasons for such a partial failure have already been put forward. As it is possible to observe on Figure 5, it appears that the number of Israelis killed in terror attacks has not decreased significantly in the aftermath of the crisis. Yet more strikingly, Figure 5 reveals that overall, the number of terror attacks has slightly increased, on average, in the same period, and their occurrence has become steadier. While their monthly average was approximately of 105 in the 11 months leading to the operation, with a standard deviation of roughly 57 attacks, (a very instable situation), they have shifted to an average of 116 in the 11 months following, with a standard deviation of 22 attacks. It is worth adding that none of these measures include the figures of November 2012. Hence it may be argued that the operation actually resulted in a stable increase in the level of terrorist violence in Israel. Fig. 5: Indicators of the violence perceived in Israel. Data collected from the ISA. This paper focused on the possible use of offensive counter-terrorism operations for electoral purposes. The argument is that, in democratic countries having a long experience with terrorism, the political effects such a factor may have on the public are likely to have become a fact policymakers are aware of. Therefore, the possibility of those who would benefit from them to exploit this resource when in power to help for upcoming elections cannot be ruled out. Using the example of the Israeli January 2013 national elections, this issue has been explored in the light of Operation Pillar of Defence that occurred exactly two months earlier. The expectations raised by the literature were that a politically efficient exploitation of this crisis would make the issue of terrorism particularly salient to the public, so that conscious and unconscious security concerns would work in favour of the hard-liners - Netanyahu and the Likud. This may have been all the more needed by this party as the US presidential election that was occurring at the same time could have diverted the attention of the public from domestic issues. Therefore, a politically successful operation would have triggered a dramatic response, both raising the concerns of the Israelis and demonstrating the ruler’s ability to firmly handle the situation. Although the intentions of policymakers are always a matter of dispute, this study has showed that the arguments put forward for the necessity and proportionality of the reaction are debatable. Firstly because the events that led to the escalation were not fully new to the country: they had already occurred under the same government and had not been dealt with in the same way. Secondly, precisely because the way of dealing with it, with regards to its more restrained alternatives, previously used in the same circumstances, may have been expected to provoke a burst of violence, both in the short and the long term. Consequently, the argument of this paper is that the selection of the moment for a change in counter-terrorism response, as well as the more offensive type of reaction adopted - with all the somewhat foreseeable dramatic escalation that would follow - may be better understood in the lights of the expected political effects of the psychology of terrorism in electoral periods. Naturally, interpreting intentions is never an accurate science, but more generally, this paper meant to stress that the question of counter-terrorism deserves critical attention. The main point here was to illustrate the possibly complex and unintuitive motives likely to be at the source of apparently purely strategic and tactic counter-terrorism decisions. Given the extensive and well-researched psychological effects of terrorist attacks, it has been argued that one should be cautious not to draw too readily Manichean a dichotomy between the perpetrators and the victims, for the latter, too, may have an interest in exploiting this mechanism. Such considerations should hence be taken into account when researching the still largely under-explored field of counter-terrorism policies. About the author: Philippe Orenes is an MLitt candidate at the Centre for the Study of Terrorism and Political Violence of the University of St Andrews. Born in 1992 in Bordeaux, France, he holds a BA in Political Science from Sciences Po Paris, completed in 2013 after a one-year exchange programme spent at the University of St Andrews where he subsequently enrolled for a master’s degree in Terrorism Studies. His postgraduate studies focus on the exploration of modern political violence from a multidisciplinary perspective, trying to understand the multiple parallel dynamics that sustain modern conflicts. This implies combining history, sociology, psychology, epistemology and political science and philosophy to approach terrorist and more conventional conflicts in a comprehensive way that focuses on insiders’ perspectives as well as on more macro-level explanations. Berrebi, Claude, Klor, Esteban (2008). “Are voters sensitive to terrorism? Direct evidence from the Israeli electorate”; American Political Science Review, 103:3; 279–301. Byman, Daniel (2011). A high price: the triumphs and failures of Israeli counter-terrorism. Oxford University Press. Brym, Robert (2012). “Collective and State Violence in the Palestinian-Israeli Conflict: The Limits of Classical Rational-Choice Theory”, Canadian Review of Sociology, 49, 3, 233–46. Echebarria-Echabe, A. & Fernandez-Guede, E. (2006). Effects of terrorism on attitudes and ideological orientation. European Journal of Social Psychology, 36, 259 - 265. Ganor, Boaz (2005). The counter-terrorism puzzle: a guide for decision-makers, Transaction Publishers. Gazit, Nir; Brym, Robert (2011). “State-directed political assassination in Israel: a political hypothesis”; International Sociology 26(6) 862 - 877. Gilboa, Eytan (2007). “The media campaign in the 2003 Israeli elections”, Israel Affairs, 10:4; 217–241. Harkov, Lahav (15/11/12): “5 of last 7 elections took place after IDF ops”, The Jerusalem Post. Israel Ministry of Foreign Affairs: Operation Pillar of Defence, available at: http://www.mfa.gov.il/mfa/foreignpolicy/terrorism/pages/israel_under_fire-november_2012.aspx. Israel Security Agency: report on Operation Pillar of Defence, available at http://www.shabak.gov.il/English/EnTerrorData/Reviews/Pages/OperationPillarofDefense.aspx. Israeli Defence Forces: Summary of events of Operation Pillar of Defence, available at: http://www.idfblog.com/2012/11/22/operation-pillar-of-defense-summary-of-events/. Kendall, J. Nicholas (2002): “Israeli Counter-Terrorism: ‘Targeted Killings’ Under International Law”, in North Carolina Law Review, 80, 1069–1088. Landau, M. J., Solomon, S., Greenberg, J., Cohen, F., Pyszczynski, T., Arndt, J., Miller, C., Ogilvie, D. M., & Cook, A. (2004). “Deliver us from evil: The effects of mortality salience and reminders of 9/11 on support for President George W. Bush”. in Personality and Social Psychology Bulletin, 30, 1136 - 1150. Lum, C., Kennedy, L.W. and Sherley, A. (2006). “Are counter-terrorism strategies effective? The results of the Campbell systematic review on counter-terrorism evaluation research”. Journal of Experimental Criminology, 2, 489 - 516. Morag, Nadav (2005). “Measuring success in coping with terrorism: the Israeli case”. Studies in Conflict & Terrorism, 28:307 - 320. Plaw, Avery: Targeting Terrorists: A License to Kill? Ashgate: Aldershot, 2008. Probst, P.S. (2005) “Measuring success in countering terrorism: Problems and pitfalls”. In P. Kantor et al (Eds) Intelligence and Security Informatics, 316 - 321, Berlin: Springer-Verlag.